I went to the movies and saw Snow White and the Huntsman the other day. It was the perfect combination of fantastical special effects and very scary acting from Charlize Theron. It seems like re-worked fairy tales are all the rage at the moment. From the other Snow White movie to the TV series Once Upon A Time to books like Bitter Greens by Kate Forsyth (a retelling of Rapunzel). There’s even going to be a Sleeping Beauty movie told from the perspective of the evil Queen, played by Angelina Jolie (Maleficent). As well as a reworking of Hansel and Gretel as witch hunters (coming out in 2013 starring Jeremy Renner and Gemma Arterton). Perhaps fairy tales never go out of style. They are always there waiting to be retold. In our shaky economic times, it’s nice to escape into worlds of pure fantasy. • Labyrinth – A very young Jennifer Connelly wishes that her annoying baby brother would be taken away by the Goblin King, played by a very creepy, big-haired David Bowie. It is just a comment made in the heat of the moment, but the Goblin King hears her and takes her brother away. To get her brother back she must set off into the treacherous Labyrinth that surrounds the Goblin King’s castle before time runs out. Along the way she meets lots of colourful characters from Jim Henson’s puppet workshop. I’m not ashamed to admit that I still know all the words to all the songs. • The Princess Bride –This film is based on the book written by William Goldman. It has all the fairy tale elements you could hope for: a princess called Buttercup, an evil prince, a giant, a swash-buckling pirate hero, sword-play, romance, magic and lots of classic one-liners from the likes of Billy Crystal. • Ever After – Drew Barrymore stars in this retelling of the Cinderella story. I put this DVD on from time to time when I want to watch a light, non-taxing film. • Ladyhawke – A classic film starring Michelle Pfeiffer. Two lovers have been cursed by a powerful Bishop. The man is a wolf by night while his love is in human form. And she is a hawk by day while he is a man. They seem doomed until a young thief played by Matthew Broderick agrees to help them lift the curse. • Enchanted – I thought this was a clever reworking. Amy Adams plays Princess Giselle who is transported from her cartoon fairy tale world into the harsh streets of real world New York. Hilarity ensues – especially the scene where she gets rats and pigeons to help her clean her rescuer’s apartment. To wrap up this homage to fairy tales, go and visit the blog of Emeline Morin. I stumbled upon her blog this week. It is devoted to fairy tales and their reworkings. I particularly like the beautiful artwork in this post. Next Article Are Sequels Always a Good Idea? What a great post! I’m very interested in fairy tales having studied the tales of Charles Perrault for part of my French degree. We looked at their appeal to children and adults Perrault wrote for adults) and the psychological element as discussed by Bruno Bettelheim in The Uses of Enchantment (which at the time I thought was nonsense but now have come round to taking more seriously!) and I’d love to see that element brought out in some of the “grown up” fairy tale films. I notice you haven’t included Stardust in your list of films – have you seen it? It’s very much in the tradition of The Princess Bride, one of my favourite films – and books – and some very knowing modern twists! That’s so uncanny. I was going to put Stardust. I love that film as well! You’ve made me want to go and read it too! Stardust is a great movie/book and if you can find it, I highly recommend the version illustrated by Charles Vess, it’s amazing! My favourite fairy-tale is East of the Sun, West of the Moon, it’s a scandinavian version of Beauty and the Beast, and the one I had as a kid was illustrated by PJ Lynch, I worship this book! Have you seen Ridley Scott’s Legend? Quite dark and creepy sometimes but good! I loved Ever After too…though the only thing that saved Enchanted for me was Patrick Dempsey 😐 Amy Adams was a sight too sugary for me to digest. 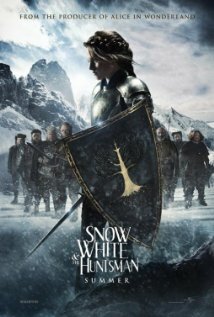 And unfortunately, Snow White and the Huntsmen was sorely disappointing too. I’m not a Kristen Stewart fan and this movie reminded me all over again why. Charlize Theron was brilliant, though. Thank God. Yes, Kristen Stewart wasn’t very good in Snow White. It was very visually pleasing but no much of an actual story. Labyrinth and The Princess Bride are two of my all time favourite childhood films. I had both on video and wore the videos out I watched them that much! I now have DVD copies which are wearing better. Glad to hear my favourite movies are also your fav childhood movies. I haven’t seen that Grimm TV series but it sounds great. Will have to get my hands on it somehow! Cool! I hope you got a great mark.